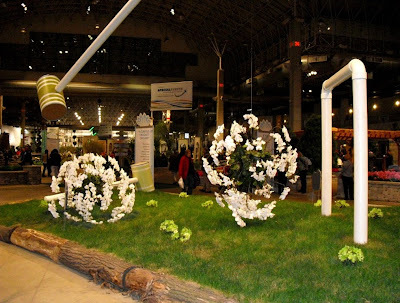 I always manage to have a good time at the annual Flower and Garden Show, even if it doesn't always live up to my expectations. I had found last year's show a major improvement over 2009, and I had hopes that the trend would continue this year. 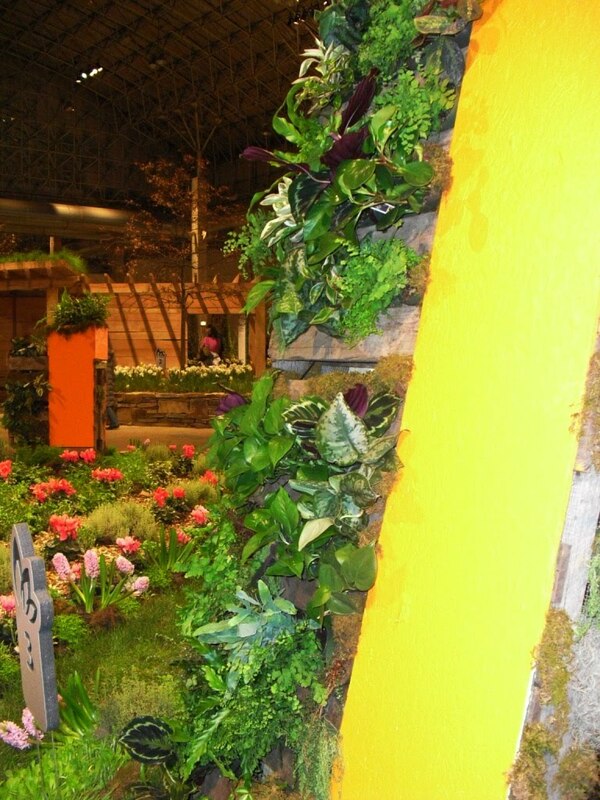 When I entered the show last Friday, and realized that the theme was "The Sport of Gardening," I was a bit concerned. I'm not at all into sports, and I thought it was a bit of a stretch to extend sports metaphors to plants, flowers and gardening techniques. So I pretty much ignored the theme, and just enjoyed the show for what it was. I've noticed that every year, there is some kind of vertical gardening display, and I always respond to those in a strongly positive way. 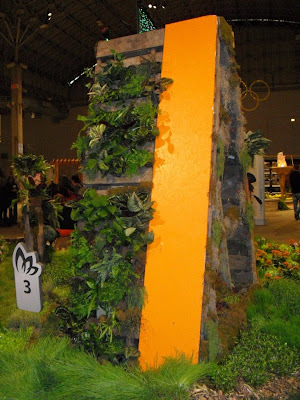 I posted a photograph of a vertical garden done by the Arthritis Foundation in one of my garden show posts last year, and this year, I probably took more pictures of the "Growing Vertical" exhibit, designed by Growing Power Inc., than of anything else in the show. For one thing, vertical displays tend to have a cool urban gardening vibe to them, which makes them a great fit for Chicago. 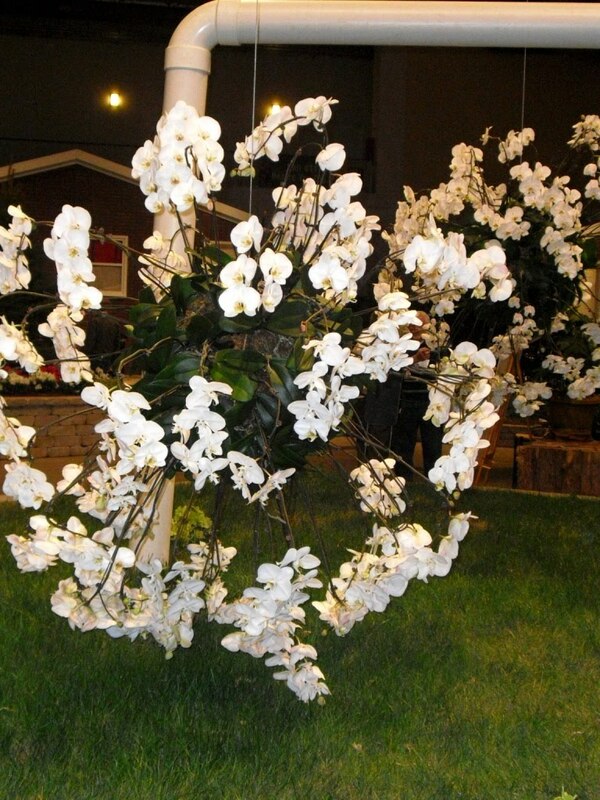 For another, the exhibitors tend to make good use of tropical houseplants or succulents in them. I live way out in the sprawling suburbs, so space-saving techniques aren't a necessity for me. But I am a city girl at heart and there is something about a small, efficient and unexpected garden that thrills me, and of course, I am houseplant lover first and foremost. 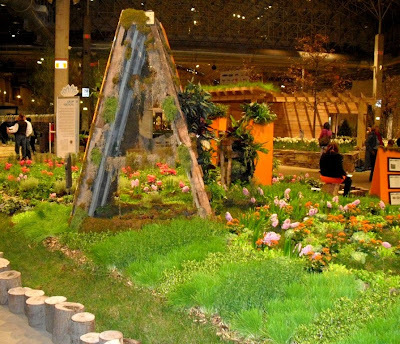 One of several ladder-shaped vertical gardens, set in a field that included orange flowered Kalachoe blossfeldiana mixed inwith conventional outdoor plants. 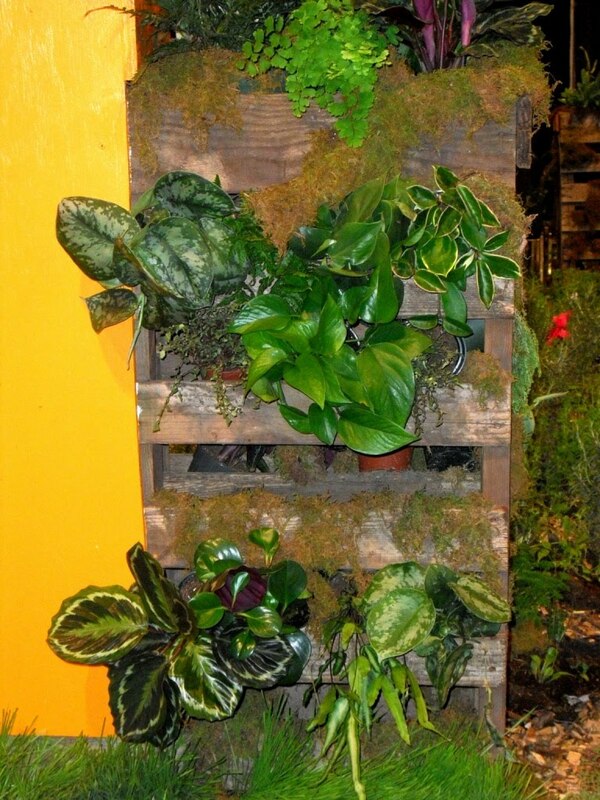 More vertical plantings, which included Epipremnum, Calathea, Scindapsis, Hoya, and various ferns. 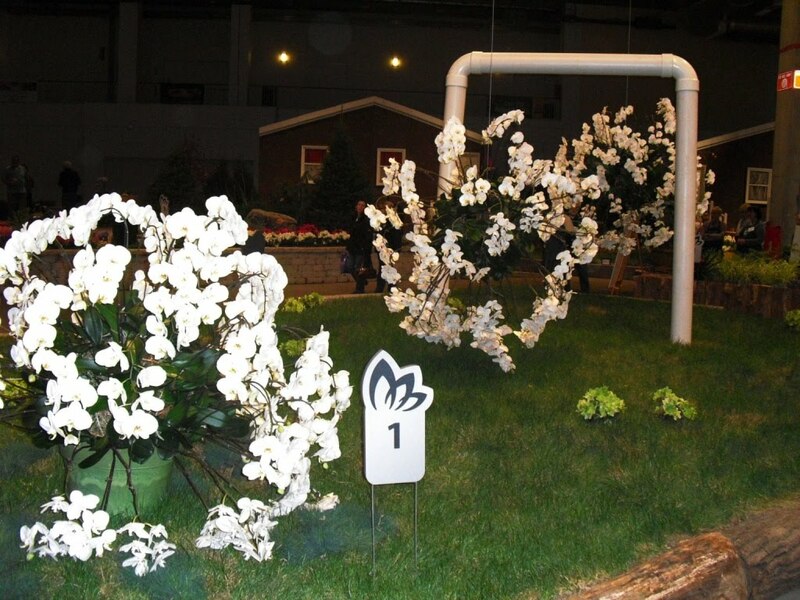 One thing I was particularly happy about this year was that the Horticultural Competition seems to be making a strong comeback. It had returned last year with a few entries after not being held the previous two, if I recall correctly. Displaying plants by grown by local plant enthusiasts and gardening societies makes the show rise above being a mere commercial venue for gardening services. 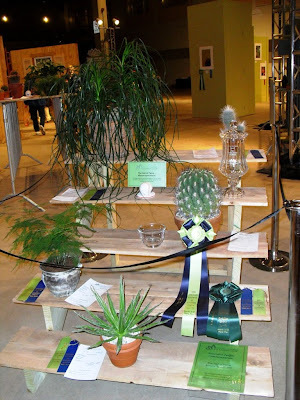 In fact, in keeping with the theme, it makes the show more than just a spectator sport. 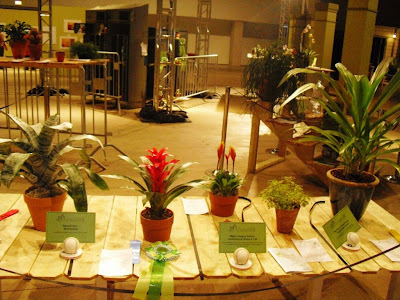 Above: Two of the competition tables. 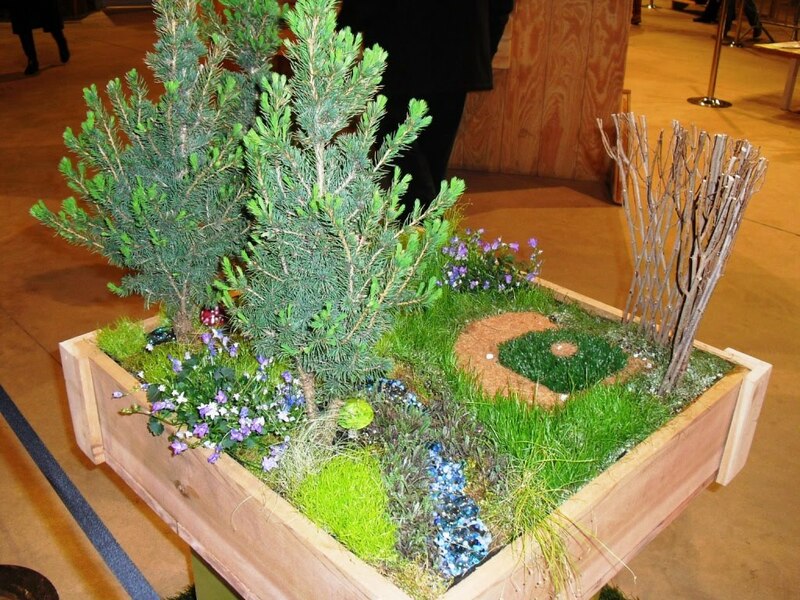 An entrant in the miniature garden category, which includes a miniature baseball diamond. Part 2 of 2011 Chicago Flower and Garden Show will be coming soon. Expect the unexpected! Thanks for the fun tour, I will be looking forward to the next part...And I completely agree about sports and sports metaphors. I prefer for them to stay as far away from my plants as possible. Another awesome post! Love the vertical garden and the epiphytes! You took some terrific pictures and thank you so much for sharing.